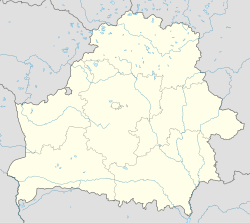 Vitebsk, an aw kent as Viciebsk or Vitsyebsk (Belaroushie: Ві́цебск, [ˈvʲitsʲepsk]; Roushie: Ви́тебск, IPA: [ˈvʲitʲɪpsk]), is a ceety in Belaroushie, near the mairch wi Roushie. The caipital o the Vitebsk Region, in 2004 it haed 342,381 indwallers, makkin it the kintra's fowert lairgest ceety. It is served bi Vitebsk Vostochny Airport an Vitebsk air base. Vitebsk developed frae a river harbor whaur the Vitba River (Віцьба, frae which it derives its name) flows intae the lairger Dvina, which is spanned in the ceety bi the Kirov Brig. Its offeecial foondin year is 947 (or perhaps 974, or 914), based on an anachronistic legend that it wis foondit bi Olga o Kiev, but the first mention in historical record is in 1021, when Yaroslav the Wise o Kiev gae it tae Bryachislav Ezyaslavovitch, Duke o Polotsk. In the 12t an 13t centuries Vitebsk wis the seat o a minor principality which thrived at the crossroads o the river routes amang the Baltic, Black, an Mediterranean seas. In 1320 the ceety wis incorporatit intae the Grand Duchy o Lithuanie; in 1569 it became a pairt o the Pols-Lithuanie Commonwalth. In 1597 Vitebsk wis grantit the Magdeburg Richts. In 1772 it wis taken ower bi the Roushie Empire in the First Pairtition o Poland. Unner Imperial Roushie, the auncient centre o Vitebsk wis rebuilt in the Neoclassical style. The toun wis a significant shtot in the Pale o Settlement, wi aroond hauf its population Orthodox Jewish at the turn o the 20t century. The maist famous o its Jewish natives wis the painter Marc Chagall. Up tae the Seicont Warld War, lik mony ither ceeties in Europe, Vitebsk haed a significant Jewish population: accordin tae Roushie census o 1897, oot o the tot population o 65,900, Jews constitutit 34,400 (sae aroond 52% percent). In the years 1919–1991 Vitebsk wis pairt o the Soviet Union. Durin Warld War II, the ceety wis unner German occupation (10 Julie 1941 - 26 Juin 1944). Hintle o the auld ceety wis destroyed in the ensuin battles atween the Nazis an the Red Airmy. In Januar 1991, Vitebsk celebratit the first Marc Chagall Festival. In Juin 1992, a monument tae Chagall wis erectit on his native Pokrovskaja street an a memorial inscription placed on the waw o his hoose. Syne 1992, Vitebsk haes been hostin the annual Slavianski Bazaar in Vitebsk, an internaitional airt festival. Its main program is devotit tae Slavic muisic. The main participants are airtists frae Roushie, Belaroushie an Ukraine, wi guests frae mony ither kintras, baith Slavic an non-Slavic. The ceety lang preserved ane o the auldest bigginss in the kintra: the Annunciation Kirk. This magnificent sax-pillared biggin dates back tae the period o Kievan Rus. It wis constructit in the 1140s, rebuilt in the 14t an 17t centuries, repaired in 1883 an destroyed bi the Communist admeenistration in 1961. Scarce remains o the kirk wur conserved till 1992, when it wis restored tae its presumed oreeginal appearance, awtho it's a moot pynt hou the kitk leukit lik when it wis first biggit. Kirks frae the Pols-Lithuanie period wur likwise destroyed, awtho the Resurrection Kirk (1772–77) haes been rebuilt. The Orthodox cathedral, dedicatit tae the Intercession o the Theotokos, wis erected in 1760. Thare are an aa the toun hall (1775); the Roushie govrenor's palace, whaur Napoleon celebratit his 43rd birthday in 1812; the Neo-Romanesque Roman Catholic cathedral (1884–85); an an obelisk commemoratin the centenary o the Rousie victory ower Napoleon. Vitebsk is an aw hame tae a lattice steel TV touer carryin a horizontal cross on which the antenna mast is guyed. This touer, which is nearly identical tae that at Grodno, but a few metres shorter ( 245 metres in Vitebsk versus 254 metres at Grodno) wis completit in 1983. Wikimedia Commons haes media relatit tae Vitebsk. This page wis last eeditit on 10 Mairch 2018, at 20:38.